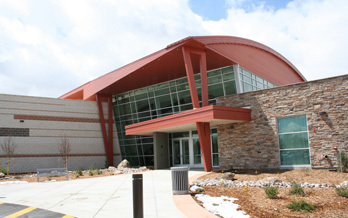 The Washakie Museum and Cultural Center in Worland, Wyo., had its Grand Opening May 15. As my loyal readers know, I am enamored with museums. I like them small and big. They can be state-of-the-art or operated by dedicated volunteers who have cleaned their attics and found “treasures” to display. I will go out of my way to visit a museum, or delay my departure from a community to wait until the “museum opens” so I can take a look at the artifacts and stories told inside the walls. I serve on the board of the museum in Encampment, Wyo., so I know and understand all the issues facing museums: never enough time and money to do all that needs to be done. I have had an opportunity in my other job (as an executive producer for Boston Productions), to work on exhibits and films and media displays for museums and interpretive centers. And it was in this capacity that I became involved with the brand-spanking-new Washakie Museum and Cultural Center in Worland, Wyo. Just barely a year ago I became a producer for media exhibits at the new museum. Last summer the BPI crew spent time in the Big Horn Basin filming for various components in the museum. This new facility has two primary galleries. One focuses on the very old story of the region – geology, paleontology and archaeology; and the other involves the stories of the more recent past – the settlers ranging from cattle and sheep ranchers to railroaders and townsfolk. The stories told in the “historic” area include those about the cattle kings who ran the first large herds in the Bighorn Basin, the devastating winter of 1886-87, the sheep wars including the Spring Creek Raid and oral histories of women who were early residents in the town of Worland. The exhibit on Cattle Kings, places the visitor right in the ranch bunkhouse, in position to receive orders for work to be done from the cattle baron who rides into the scene delivers his directives and then rides away again. At the same time you see him talking to you in the doorway, you can see a couple of ranch hands working near a chuckwagon – visible through the window of the bunkhouse. For another exhibit on livestock ownership, you can play a video game that allows you to decode brands or make your own brand and e-mail it home. I like the ranching history represented in these exhibits, but will admit that I learned a lot in working on the exhibits in the paleontology/geology/archaeology gallery. In filming we had the opportunity to visit the field camps of some of the leading scientists who work in the Basin every summer. We started in the period 145 million years ago at the camp in the northern end of the Basini where Dr. Glenn Storrs is excavating dinosaurs. Later we worked with Dr. Scott Wing of the Smithsonian who studies plant fossils in an effort to understand how and why the earth had a sudden warming event 55 million years ago. Known as the Paleocene Eocene Thermal Maxim (PETM), this event changed the earth in profound ways. The research Dr. Wing and others, are doing may help in the understanding of the warming trend the Earth now is experiencing. We filmed Dr. Ken Rose, who is an expert on fossil mammals, and the discoverer of an ancient, micro-miniature version of the horse. On the day we filmed him, his team found the jawbone of one of these tiny, tiny horses – it was less than a quarter-inch long! Our film crew also worked with Dr. Marcel Kornfeld from the University of Wyoming, an archaeologist who is studying early rock shelters in the Bighorn Mountains. All of their fascinating stories are incorporated into the Washakie Museum exhibits, in a film titled “Why We Dig” and other exhibits. The main exhibit interpretation and design was done by ECOS of Boulder, Colo. This new museum and cultural center is a gift to the city of Worland from a resident who was successful in business and wanted to give back to his community. The Washakie Museum and Cultural Center also has a temporary gallery for rotating exhibits – currently it features photographs taken by people from throughout the area, and a space for concerts, performances, and other community and cultural events. I highly recommend a visit to this newest Wyoming museum.